Zig-Zag Rillo Size Cigar Wraps are packaged in air tight resealable foil pouches to help ensure the freshness of Zig-Zag's unique flavor system every time. 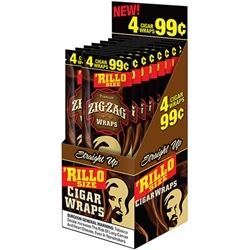 Zig-Zag's mouthwatering Rillo size Straight Up flavored wraps are just your match. Try them here at Smokers Discounts!